There was a community garden work day on Saturday, and we had a good turn-out of board members to do some end-of-year winterizing in the beds. The weather ended up being much nicer than I had expected: cool, but no rain or wind, and we even saw sunlight briefly. 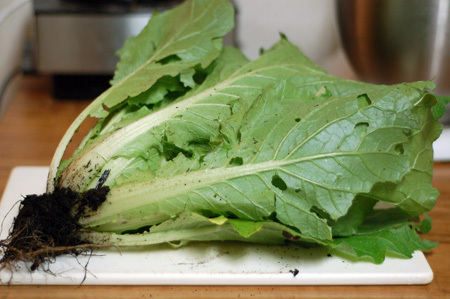 We harvested all of a radish bed and thinned a bed of Chinese cabbage that was starting to get eaten up by slugs, so I have loads of greens to cook with this week. It was a good thing we got out there when we did, too, because last night it snowed. In Oregon. In November. For reals! I decided to use some of the Chinese cabbage to make potstickers with my usual recipe. Of course, that also meant making the wonton skins. I went ahead and made a full batch, partly because I was feeling lazy after washing and chopping greens for what felt like an eternity and didn’t want to bother separating an egg. Since I only needed half the dough for my potstickers, I saved the rest in a sandwich baggie, and used it a day or two later to make these unusual lamb dumplings. 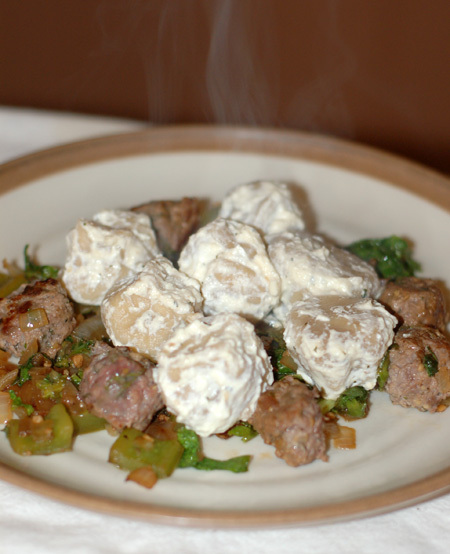 When I looked up lamb dumplings or potstickers, I kept coming across similar recipes for Turkish, Kazakh, Uzbek, Afghan, and even Mongolian lamb dumplings served with a yogurt sauce or dip. Honestly, the yogurt tie-in was what tipped the scales, and I ended up selecting a recipe from Andrew Zimmern, the Bizarre Foods guy, who apparently adapted it from a recipe calling for rotting mutton and mare’s milk yogurt. Appetizing, no? I ground my own lamb meat from the piece of leg that didn’t get turned into gyros earlier in the week, and drained some of my homemade yogurt for the sauce. Andrew suggested two different methods for shaping these dumplings. I went with a third variant, based on a little video about Mongolian buuz dumplings, which showed them crimped into little puckered purse-like packets. As for the sauce, I was leery of heating the yogurt—or scorching it, as Andrew described the technique—since I have had problems with yogurt sauces separating on the stove before. This time, however, it was not an issue, as the thickened yogurt acted very much like cream cheese or mascarpone and just melted a little. Finally, coming back around to that Chinese cabbage, I did a little vegetable stir-fry based on a Czech cabbage dish to make a bed for the dumplings, and threw in some little lamb meatballs made of the excess dumpling filling, just for the heck of it. Jeremy ate his entire plateful, and commented that he especially liked the yogurt-coated dumplings. I ate a few bites and decided I was disappointed in the texture of the lamb and the flavor of the vegetables, but I think the dumplings themselves are worth tweaking in the future—cross-breeding them with a pierogy could yield excellent results, for instance. Combine the lamb, onion, 1 tsp garlic, parsley and chili, and season well. Reserve in fridge. 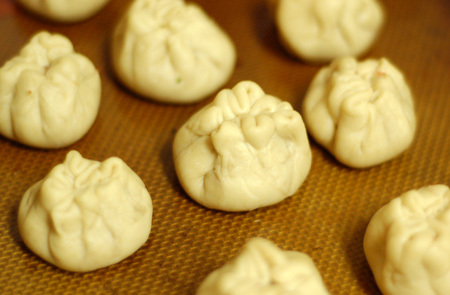 For the wrappers: Make a half-batch of wonton dough (or a full batch and reserve half for another use), and allow to rest for at least half an hour. Roll out into 1-inch thick rope, then cut into 3/4-inch pieces. Roll pieces out into 2-inch circles, one at a time. One wrapper at a time, place a teaspoon of filling in the center, fold wrapper up around filling, pleating around in a circle. Make sure no filling is coming out the top and press the pleats together in the center like a drawstring purse to seal. Set on a silpat or baking sheet dusted with cornstarch, making sure not to let them touch. Place dumplings a few at a time into rapidly boiling salted water; stir once. When dumplings float, cook for 2 minutes more and drain. Repeat with remaining dumplings. Heat a large sauté pan over medium heat. Add a splash of oil and the remaining garlic and cook just until fragrant, about 30 seconds. Add the yogurt, season to taste, and when warmed through, add the hot dumplings; toss, divide into bowls and sprinkle with the dried mint and serve. Source: Slightly adapted from Travel Channel.